I wasn't too big of a Bojangles' fan until I moved to Charlotte. I was always more of a KFC guy. I mean, I ate at Bojangles' growing up, but not regularly. But because the "famous chicken-n-biscuits" chain is based here, it's pretty hard to avoid. There seems to be a Bojangles' at every major intersection. So tonight, after attending two networking events I grabbed some Bojangles' on my way home. Look at all that yummy icing. I got the usual: a two-piece with biscuit and macaroni, and two BoBerry Biscuits...hmmmm. When I got home, I pulled out my tray table, laid out my late-night dinner, and sat in front of the TV to find that the Bobcats had just lost a tough double-overtime game to the Celtics. 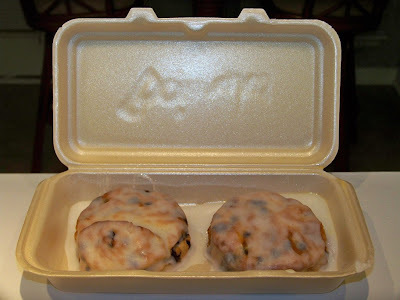 When I went to open the trademark yellow-and-red box of chicken, the receipt was taped to the top and I made a startling discovery: the two BoBerry Biscuits had cost me $1.49. You have to understand how upsetting this is. They've been two-for-a-dollar (99 cents actually) for, like, forever. It's just another sign of how this economic recession is affecting our lives. I remember that Bojangles was like a treat and KFC was the norm (as much as eating out once every few months on our budget could be a norm). But I feel your pain on the biscuits...guess I need to find a recipe so I can make my own. I work at a Bojangles in South Carolina. Sorry to hear about your issue with the biscuit price. Did you look at the price on the DT board on Menu Board inside before ordering? I cannot speak for the particular location you visited but yes our price is $1.49 on the boards although we have been running a 2 Bo Berry or 2 Cinnamon Biscuits for 0.99 for quite a while now. Perhaps this other location was running a similar special. Even at $1.49 you will not a better value at any other chicken place! What other chicken place even has sweet biscuits? NONE! Not any that you would want to eat at least! Also there are a LOT of franchise locations which may at times have different prices and specials than the corporate stores.